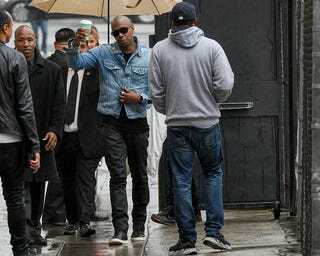 Looks like Dave Chappelle is really, officially over his self-imposed exile from Hollywood. On the heels of his not-universally-loved Netflix comedy specials and appearance on Saturday Night Live, the 43-year-old comedian has officially joined the cast of the fourth remake of A Star Is Born. According to the Hollywood Reporter, Chappelle will join Lady Gaga and Bradley Cooper in the film, and the comedian will play Cooper’s best friend, a character named Noodles. The film, which marks Cooper’s directorial debut, is in production, with pictures from the set coming out almost daily on social media. A Star Is Born is due in theaters Sept. 28, 2018.